Viewing the cherry blossoms (sakura) in full bloom is one of the main attractions for the visitors to Japan in spring. Groves of cherry trees in full blossom indeed create one of the most beautiful sights in Japan. To appreciate and enjoy its temporal beauty, people in Japan do hanami, picnic parties under the cherry trees once the flowers start opening. In this article, we will introduce some hanami spots around Tokyo and tips on how to enjoy hanami. Read this and be ready for the pink season! As the blooming time of cherry trees changes every year depending on the weather, checking the cherry blossom forecast is helpful when you plan a hanami. Once the blossoms are in full bloom, they usually last for a week, then petals will start to fall off. When the weather is bad (rain and wind), the blooming period is easily shortened. The cherry blossom forecast has been shared on GetAroundJapan. Please check the latest forecast under our “Tips” category. WHERE are the good hanami spots? Hanami can be enjoyed both during the day and at night anywhere as long as there are cherry trees. Listed here are only a few of the many hanami spots around Tokyo. Yoyogi park is one of the largest parks in Tokyo located between Shibuya and Harajuku. Because of its convenient location, the park is quite crowded during the hanami season. 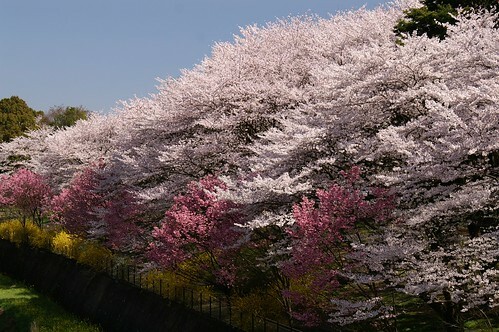 Still, it is one of the best spots in cities to have a picnic and to view different kinds of cherry trees. Train: Harajuku sta., Meiji-jingumae sta., Yoyogi-koen sta., and Yoyogi-hachiman sta.. 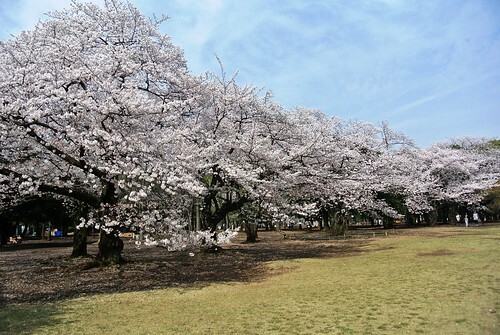 Located in western part of Tokyo, the spacious Showa kinen park has 1500 cherry trees of 31 kinds. It is a great place for family and groups as the park offers variety of facilities such as bicycles trails and rental bicycles, boat-ride in the pond, mini golf course, BBQ garden and etc. Train: Tachikawa sta.,Nishi-Tachikawa sta., and Tachikawa-Kita sta.. Admission: Adult 410 yen, Child 80 yen, Over 65 210 yen. Mitsuike park is famous as one of Japan’s “100 best cherry blossom spots”. 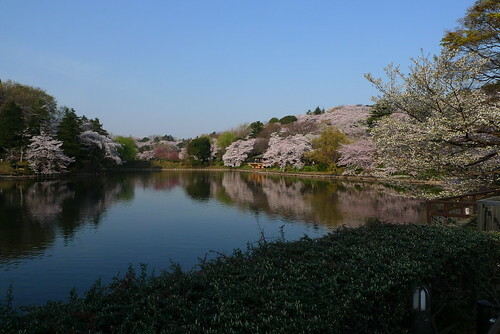 The three ponds are surrounded by over 1600 cherry trees of 78 kinds. Located in Yokohama. Train: From JR Shinyokohama sta., take bus no.6 or 104 bound for Tsurumi station west exit and get off at “Mitsuike-koen kitamon”. From JR Tsurumi sta., take bus no.6, 67, or 104 bound for Shinyokohama or Kajiyama and get off at “Mitsuike-koen kitamon”. 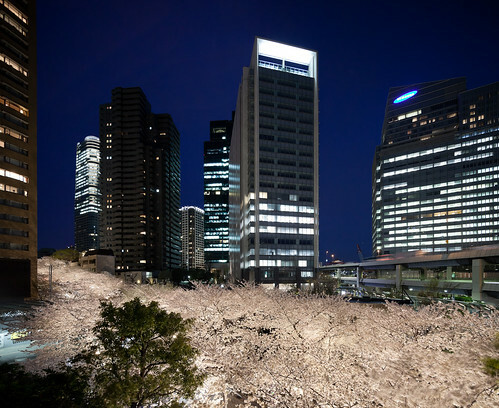 The 1km long row of cherry trees from Roppongi-Itchome station to Tameike-Sanno station is illuminated at night between 17:00-22:30 during the blooming season until mid April. Also, ARK Hills Sakura Festival 2015 will be held from April 3th to 5th at ARK Karajan Place. There will be food stalls, workshops, and live performances. Location: Around Roppongi-itchome station and Tameike-Sanno station on Tokyo Metro. Train: Roppongi-itchome sta. and Tameike-Sanno sta. WHAT do I need to know to enjoy hanami? Here are the tips and the basic rules on how to enjoy hanami. Bring your own bento, snacks, and drinks. If you go to depachika (the food section in department store), you will find some “hanami bento”. Bring your own picnic sheet and tissue paper. You can find all the necessary picnic items at 100 yen shops. Bring them back with you or throw them in the trash bins in the park. If you’re going at night, keep yourself warm. It can get really cold at night. Kairo (pocket warmer) will be handy. Do not damage the trees. Do not sit on the roots or lean on the tree. Let’s hope the weather will be good this spring so that the flowers will last longer! !